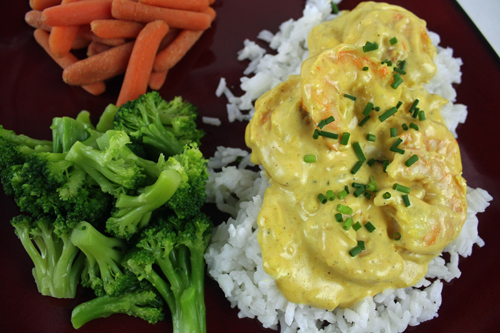 Shrimp Curry over rice tastes delicious and is perfect for dinner. An easy DIY recipe tutorial idea that will bring the family together. Hi! I’m Donna from Self-Reliant Living and I am so happy to be a contributor! One of my favorite things to do is to cook (because I really, really like to eat), and this recipe is one that I have been making since I was 13 years old. It’s still one of my go-to recipes when I want a quick, elegant looking dinner. I hope you will enjoy it as much as I do! Before you start making the Shrimp Curry, get 2 cups of water boiling for the rice. Once the water boils, add 1 cup of rice, and return to a boil. Now turn the heat down as low as possible; cover the pot, and let it cook for exactly 20 minutes. 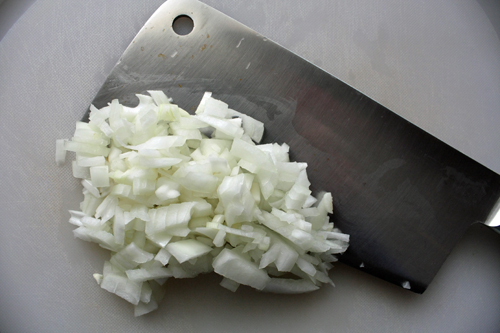 Dice an onion – enough to make approximately 1/4 cup. 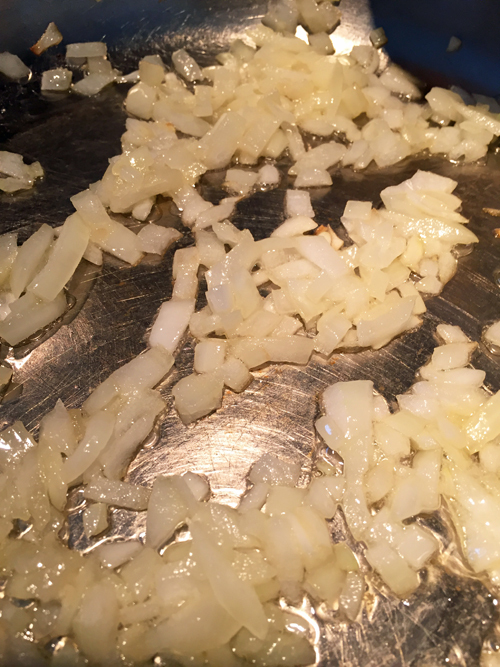 Saute the onion in butter. 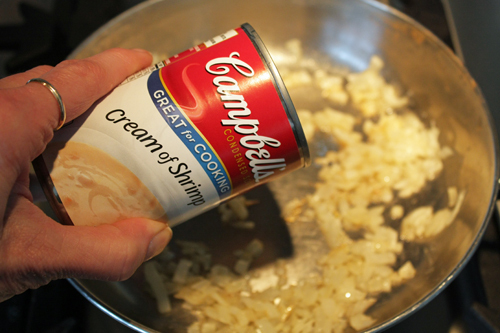 Once the onion is translucent and soft, add the can of Cream of Shrimp soup and stir. Heat thoroughly, and then sprinkle with curry powder. Add the shrimp, and heat thoroughly. 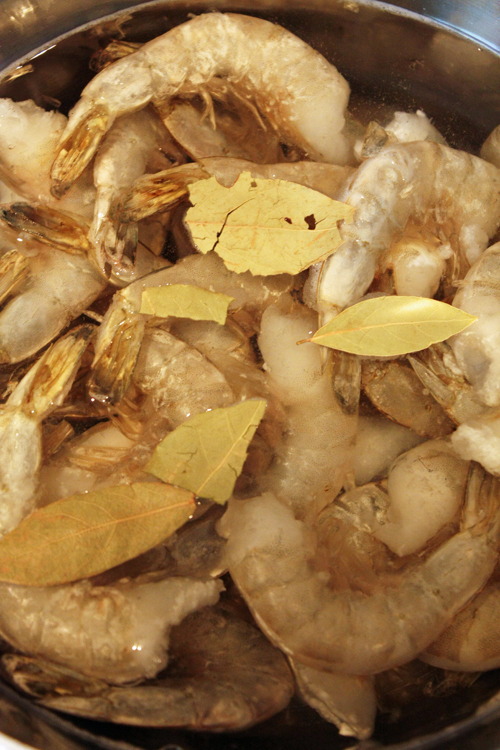 For this recipe, I started with uncooked, easy-peel medium sized shrimp. I briefly boiled the shrimp beforehand and peeled them once they cooked down. This is right about the time I start cooking the vegetable side dishes in the microwave – a few minutes for fresh baby carrots, and another few minutes for the frozen broccoli florets. Once the sauce and shrimp have been heated through, stir in the sour cream and add salt & pepper to taste. Check to see if the rice is done. 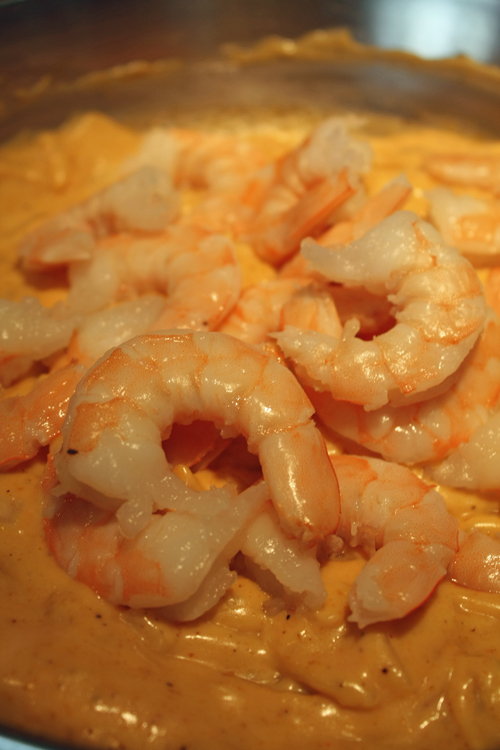 If it isn’t ready yet, keep the shrimp curry at a low simmer, stirring frequently – but don’t let it boil. When the rice is ready, you can start plating – a cup or so of rice; top with the shrimp curry; garnish with snipped chives; add the vegetable sides – and enjoy! What is a favorite recipe of yours? Share and leave a comment below. 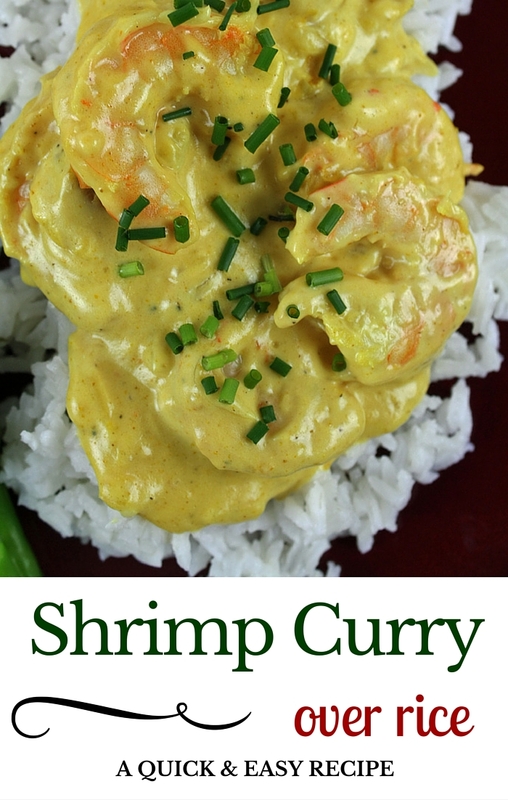 SAVE HOW TO MAKE SHRIMP CURRY OVER RICE TO YOUR FAVORITE RECIPE PINTEREST BOARD! Yum! I love curry and shrimp, so good! And this is super easy to make too! I love curry dishes. Pinning and making this. Thanks Beverly! I’m new to curry myself, and I love it! This looks oh, so lish! I haven’t tried the soup called for in the recipe…I’m intrigued…Pinned, and can’t wait to try this! Thanks for stopping by Ginger! When you give the recipe a try, I’d love to know what you think! Such a quick and easy meal, how awesome! Love shrimp, I will definitely have to give this a try! Great work! Thank you Sahana! I am so glad that you stopped by. looks doable and delicious! thanks for this! i blog recipes on fridays so hop on over and maybe we can share some.